The Sweet Kitchen is hosting Presto Pasta Night and this week I've got a pasta that some will either love or hate, Squid Ink Spaghetti. When it comes to squid ink pasta, fresh is best and while I'd love to say I made these, I've bought them from the fresh pasta stall at Prahran Market. I think some people are put off thinking that it tastes fishy but I can assure you they don't - it is basically used as a colour shift. If like their appearance but you're still a bit unsure, then maybe black bean spaghetti might be more your cup of tea. Usually when it comes to cooking, I find a lot of my inspiration in the meals that I've enjoyed while dining out, however, in this case, the dish I've made is the result of a rather poor pasta dish I recently had the misfortune of ordering. To wipe that bad pasta from my mind I set about creating my own version - Squid Ink Spaghetti with Anchovy Sauce and Pangrattato. Cut a couple of thick slices of sourdough and then cut them into cubes. Place in a food processor and process until roughly chopped - you want a mix of fine and a little bit thicker breadcrumbs. Drizzle a little oil oil in a skillet and place over a medium heat. When warmed, add the crumbs and toss well. Cook until golden and crunchy, drain on paper towels and then place in a bowl. Throw in a handful of chopped parsley leaves and the zest of half a lemon - toss this together to distribute. The sauce can made while the pasta cooks and should be ready by the time the pasta has cooked through. I should also note that while the sauce contains a whole tin of anchovies the end product isn't overly fishy, it is more of a savoury note. Drizzle a little of the anchovy oil and a spoonful of olive oil into a pan and place over a gentle heat. Roughly chop the anchovies before adding to the pan. Stir until the anchovies start to melt into the oil and as soon as it has warmed through and become a smooth sauce remove it from the heat. Add the rest of the grated lemon zest and stir. Drain the pasta well - this is one time when you don't want a lot of water left behind. Add the pasta to the sauce, along with a large spoonful of the prepared pangrattato. Toss this well so that it's well distributed. Spoon out into bowls and top with the rest of the pangrattato. I do love this pasta - it is simple but every mouthful makes you eager for the next. There is texture in the crunch of the breadcrumbs and a subtle freshness from lemon zest and parsley. This is just how pasta should be, simple and tasty. I love the saltiness of anchovies. That is one fantastic looking dish! Thanks so much for sharing. It's definitely on my must have list. Count me in the "love it" camp. Looks awesome! 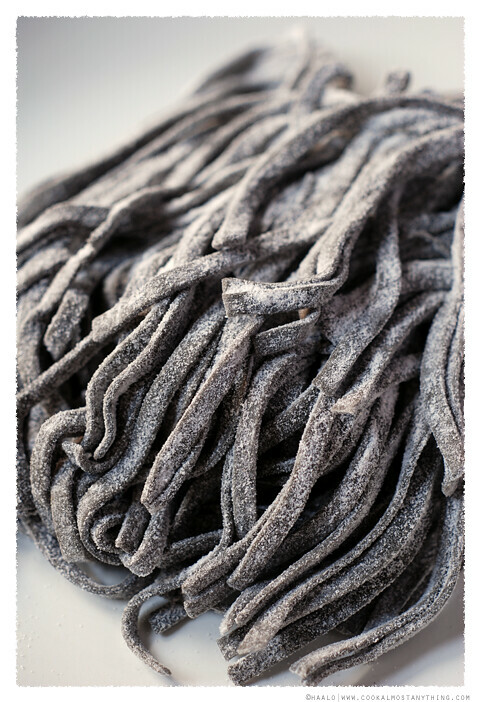 Love the photo of the fresh pasta - looks like sugared licorice! The recipe sounds right up my alley too as I love those salty fishy anchovy flavours. I like the pasta. Fresh idea for me. I once had tasted one pasta dish that has a squid ink sauce for the pasta. Taste good. Sounds flavourful and looks awesome! Love squid ink spaghetti for it's ravishing good looks. 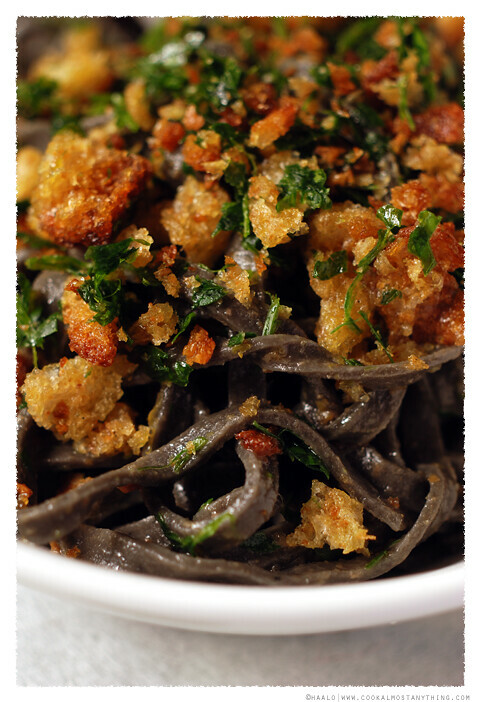 I LOVE squid ink pasta ... and this looks so tempting with the big chunks of breadcrumbs and anchovy sauce, nummyyyyyyyyy! This looks so elegant and delicious. 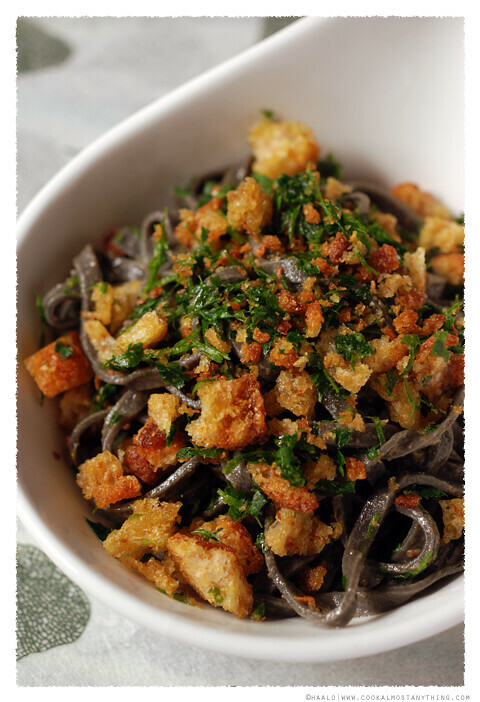 I really wish I had squid ink pasta available in my stores because I would really love to try this. 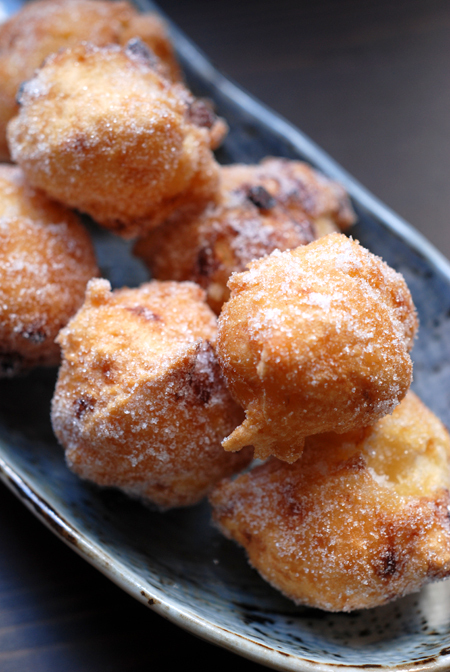 Oh wow, this dish looks amazing. And simple! I've eaten squid ink risotto in Croatia but I have never tried squid ink pasta. Can't wait to try this one. Thank you. Love it or hate, LOVE IT! Thanks Kristin - maybe you can find dried squid ink pasta? Thanks GGG - hope you get to try it soon!